Solon H. Borglum "Sculptor of the Prairie"
Solon H. Borglum (1868-1922), son of Danish Mormon emigrants, was a world-famous sculptor. 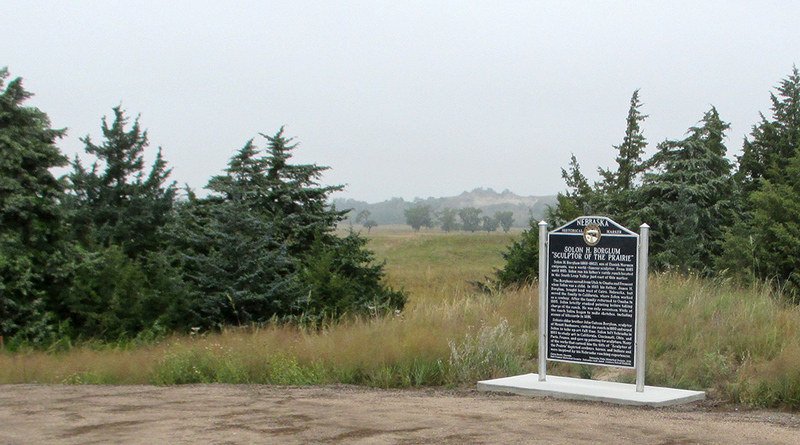 From 1885 until 1893, Solon ran his father’s cattle ranch located in the South Loup Valley just east of this marker. The Borglums moved from Utah to Omaha and Fremont when Solon was a child. In 1883 his father, James H. Borglum, bought land west of Cairo, Nebraska, but moved the family to California, where Solon worked as a cowboy. After the family returned to Omaha in 1885, Solon briefly studied painting before taking charge of the ranch. He was only seventeen. While at the ranch Solon began to make sketches, including scenes of blizzards in 1891. Solon’s older brother John Gutzon Borglum, sculptor of Mount Rushmore, visited the ranch in 1890 and urged Solon to take up art full time. Solon left Nebraska in 1893 to study art in California, Cincinnati, Ohio, and Paris, France, and gave up painting for sculpture. Many of the works that earned him the title of “Sculptor of the Prairie” depicted cowboys, horses, and Indians and were inspired by his Nebraska ranching experiences. “Solon H. Borglum "Sculptor of the Prairie",” Explore Nebraska History, accessed April 19, 2019, https://mynehistory.com/items/show/265.